The wind is the vertical and horizontal motion of air masses in the atmosphere. Global winds are caused by pressure differences, due to the non uniform heating of the Earth surface by solar radiation. The different pressure zones are due to the vertical movement of the air. 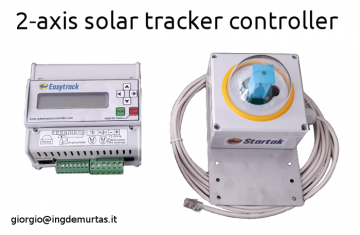 For example, at the Equator the strong solar radiation warms the ground surface. The air in contact with the ground surface gets warmer an lighter, rising up, generating a low pressure zone. At cold places, for examples the poles, the air is falling generating (relatively) high pressure zones (Figure 2.1). Usually high pressure zones are characterized by good weather conditions while low pressure zones are more rainy. The difference in pressure between geographical areas gives rise to a pressure gradient force. The pressure gradient force is perpendicular to the isobar lines, hence the air mass start the motion in the opposite direction of the pressure gradient. This large scale motion is also influenced by the Earth rotation which causes, among others, the Coriolis force. For example, a particle of air moving from the latitude 1 towards latitude 2 (figure 2.2, valid for northern hemisphere) have a velocity component parallel to the equator which is greater than the same velocity component of the particles at the latitude 2. This determine that the moving air particle is leading the other particles. For an external observer this looks like that the particle turns right. A particle moving in the other direction (from latitude 1 towards latitude 2) will be lagging the other particles at latitude 1, hence it is, again, turning right respect to the direction of motion (Figure 2.2). The Coriolis force deflects the wind to the right in the northern hemisphere and to the left in the southern hemisphere until the equilibrium between the pressure gradient force and the Coriolis force is reached (point c of figure 2.3). When there is a balance between the pressure gradient force and the Coriolis force the wind is called the geostrophic wind. This happens often above the ABL (Atmospheric Boundary Layer), but not always since the isobars are curved contours (Figure 2.3), which also gives rise to centrifugal force. 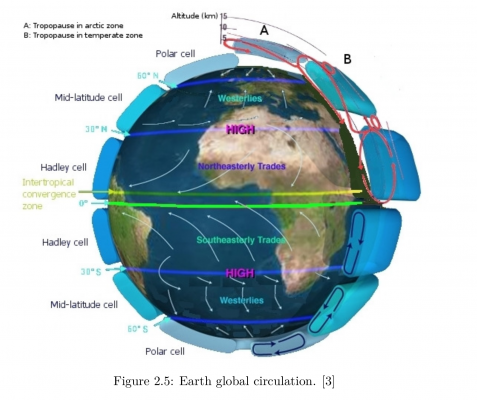 The circulation from the Equator to the poles is in the reality divided in several cells (Hadley cells, figure 2.5) because the air that rise at the equator, on the way to the poles cools down (thanks to the expansion and to heat exchange) and fells towards the ground. 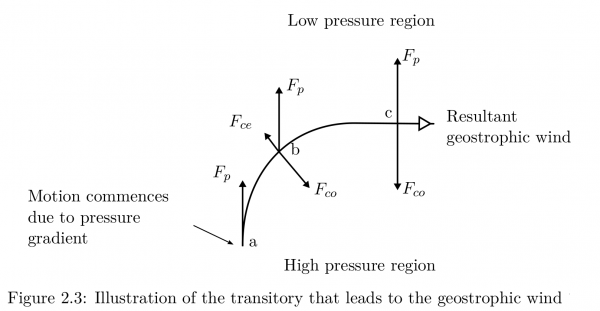 In the atmospheric boundary layer the Coriolis force also gives rise to a change of direction with height (wind veer), clockwise moving upwards: at the surface the roughness of the terrain generates a drag force that alter the equilibrium between pressure gradient force and Coriolis force. In the new equilibrium condition, the drag force and the Coriolis force are counterbalanced by the the pressure gradient force, and the wind direction is to the left of the wind direction at the top of the ABL. Hills and mountains generates local increases and reductions of the wind speed. The sea has a large heat capacity, therefore the land warms up much more rapidly than the sea. Ocean streams move heat from one region to another. Local heating or cooling can produce seasonal winds (like monsoons in India) or daily winds (like katabatic wind in Chile), or other variations of wind speed. 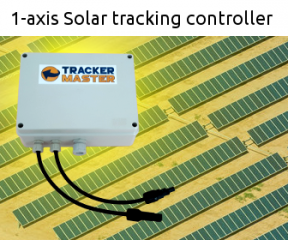 This article is an extract of my Master of Science thesis in Wind Energy “Development of a software to organize and analyse wind-mast data for wind resource and class assessment”. I wrote it in 2012 when I was student at the Technical University of Denmark (DTU) and employed as intern in Alstom Wind in Barcelona (now General Electric).